Another day, another controller review. Lol. My first “smartphone” as we would know them today, was an early Android HTC Hero, probably around Android Cupcake or so. For a long time I’ve been of the mind that Android is unusable, and I owe that a lot to my early HTC Hero. That said, after my Hero I switched to an iPhone 4S and was blown away – both by how quick and snappy it was, but also, how it was the first phone I kept for 3+ years with no real need to upgrade because it kept performing like a champ. Currently I’m on year 3+ of my iPhone 6, but I’m starting to consider switching camps again. You might wonder what smartphones have to do with a controller, well, it’s just backstory for why I bought this 8BITDO NES Bluetooth Controller. You see, my work has dozens of the latest smartphones, both for QA to test our ever-changing website, but also for us to test our VR-builds for things like Google Cardboard or the Samsung GearVR. I ended up carrying around a Google Pixel XL for development and I realized that after Google switched to their material design, Android both looks sharp (finally) but also the hardware caught up and the OS matured. At long last I might switch back to Android and be free of iTunes and other iPhone annoyances. I decided to see how emulators and how controllers work for mobile. 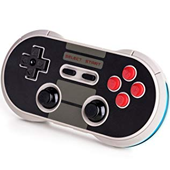 I was attracted to the 8BITDO NES controller both for it’s aesthetic and it’s features – it technically works with iPhone as well, but there’s some compromises I’ll discuss below. But first, the controller. As a controller, it suffers in the same way many modern controllers do – it’s DPad isn’t great. It FEELS good, but it’s hard to feel diagonals. This becomes a problem, because sometimes you might want to push right and the controller is sending up-right instead. You can’t feel the difference, so DPad input is unreliable. Lack of a good DPad makes this a pretty poor option for emulators. That out of the way, the shoulder buttons are clicky and feel good. There’s actually two on each side, but instead of being above and below each other like you might imagine from a Playstation Dualshock controller, they are actually side-by-side. The L2 and R2 are closer the inside, while the outer L1 and R1 are towards the sides. I love the tiny analog sticks, and almost want to take it apart to see if they have a custom set of potentiometers made to shrink the sticks. I had a first-generation PSP (Playstation Portable), and I loved the compact horizontal-sliding analog sticks on the original PSP and I feel like that design would work better here – especially since this is designed to be a portable / mobile controller. However, I personally haven’t tried the PSP Vita – the newest PSP iteration, but from a Google search it seems like PSP moved towards this style of tilting analog sticks, so maybe the original PSP analog sticks weren’t a hit with players. To be precise: the original PSP had analog sticks that didn’t tilt like you might expect, but rather, slid in all directions in a horizontal space. The height of the thumb pads remained constant, instead of changing like you would expect from tilting analog controls. The analog sticks on this 8BITDO controller do tilt, however, so they are basically shrunken baby analog sticks. Cute, but I really didn’t mind the original PSP sliding-style analogs either. Anyway, PSP comparison aside, these analog sticks aren’t as smooth as a full size controller. Then again, I am spoiled by the xBox One controller, which as far as I’m concerned, is the epitome of controller ergonomics. The xBone controller feels amazing. Back on topic: the analog sticks definitely have points in their rotation that you can “feel”. Hard to explain, but if you can imagine rotating an analog stick 360º degrees, there would be some points that have more resistance than others. Where as the xBone controller is silky smooth and all polar movement seamless. Of course, it’s a mobile controller with adorable tiny analog sticks so I don’t really mind if they aren’t perfectly smooth. It doesn’t bother me at all during gameplay, but it is something that should be mentioned. The controller can connect as a Bluetooth Joystick – which is ideal, since the concept of a joystick (gaming controller) is standard, so software can support binary and analog input in a predictable way. In Keyboard mode, the controller does what it says on the tin – behaves like a Bluetooth keyboard. So games that don’t explicitly support Joysticks but have mappable key settings can be set up to use the 8BITDO, since games just see the 8BITDO as a keyboard sending keystrokes. Finally, the controller can be used in iCade mode. Now, iCade was originally an April Fools joke from the popular tech merch store, ThinkGeek. The joke spread around and demand was so high for a real, non April-Fools iCade, that ThinkGeek actually started manufacturing and selling them. It had a 30 pin connector on the bottom, an Keyboard-like mode. It simply emulated some keys and developers could support the unofficial iCade standard to make it work. Unfortunately, the adorable iCade is out of production, and because it was a third party accessory from a random company – ThinkGeek – not too many games were made to support the iCade format. So, iCade and Keyboard mode is as good as it gets for iOS – which isn’t that great all said. But it does work well with Android and Windows – the only other systems I’ve tested with. The controller feels like it’s quality built, and is nice and tiny. It totally is small enough to carry in a pocket or backpack but also still big enough to use comfortably. It is easy to set up, and looks great. But the DPad is predictably bad, and lack of iOS MFi Joystick support is disappointing. If you’re looking for a portable Android game controller that you primarily want to use Analog controls with, then look no further. But if you want to use this for Android emulators, then the DPad is sadly disappointing.